So Thanksgiving passes and you're left with half a can of pumpkin. What to do? Chili. The answer is chili. In a soup pot I melted the butter along with a drizzle of extra virgin olive oil and sauteed the onion. 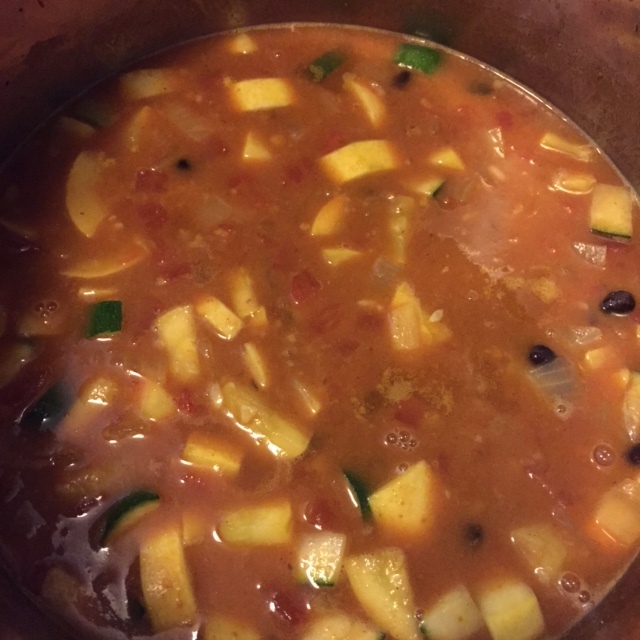 I chopped the squash and zucchini into equal size pieces and added them to the saute. I then added the spices (it smells so good) and the broth. I cooked that for a few minutes then stirred in the pumpkin and tomatoes. I let this cook on low for about ten minutes then added the beans and rice. It makes about six servings and would be delicious with a little shredded cheese on top. It has a kick but it's mild and great for cold evenings.